Solar use will push energy costs up in Mass. State officials see the expanded production targets triggering a proliferation of solar power across the state. Massachusetts utility customers could get hit with more than $1 billion in higher electricity bills over the next two decades under Governor Deval Patrick’s plan to dramatically expand solar power in the state, government and industry officials said Tuesday. A top state official said that the average residential customer would pay $1 to $1.50 more a month under the Patrick plan, which aims to cut air pollution and create more jobs in the growing solar energy industry. In a filing with state regulators last month, Northeast Utilities System, which serves 1.3 million customers in the state, contended Patrick’s plan to quadruple the amount of solar power in use in Massachusetts would lead to consumers paying “excess costs” of more than $1 billion because of how they would be forced to buy the electricity. The result, Northeast said, is that Massachusetts consumers would pay two to three times as much for solar power as ratepayers in neighboring Connecticut, where the company also provides electric service. Mark Sylvia, commissioner of the Massachusetts Department of Energy Resources, acknowledged in an interview that the added cost could range from $500 million to $1 billion over the next two decades, about $1 to $1.50 more a month for residential customers. But Sylvia said in exchange for higher bills, Massachusetts residents would get cleaner air, a more diverse source of electricity, and a dynamic clean energy sector. 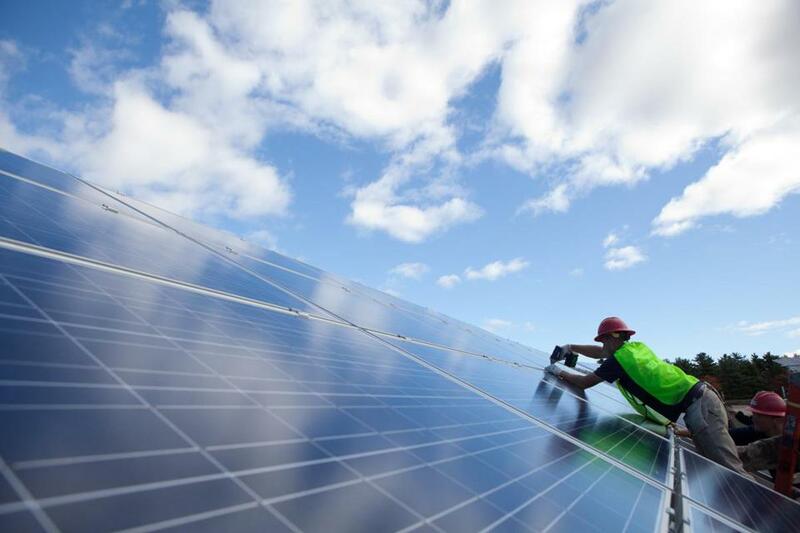 “We’re building upon success,” said Sylvia, noting that in 2013 Massachusetts exceeded its previous goal of 400 megawatts of solar power several years earlier than expected. Now the administration has set a more ambitious target: 1,600 megawatts by 2020. State regulators have been conducting hearings and soliciting comments on the proposal for almost a year now, and the new solar targets could be adopted as soon as March. The alternative energy industry is a pet project of Patrick’s. One of the governor’s signature achievements so far is a 2008 law, the Green Communities Act, that seeks to reduce energy consumption and promote conservation and renewable resources among consumers, while also creating a flourishing alternative energy industry in Massachusetts. One way to do that is to force utilities and other large electricity consumers, such as factories, to buy a certain amount of their power from alternative energy producers like solar and wind farms. Utilities don’t object to the goal. Rather, they are concerned with how the governor’s plan would require them to obtain the power: by buying from a mix of large and small producers. That approach, the utilities argue, would result in them paying much higher prices for solar power — much like buying groceries at a corner convenience store instead of a large supermarket. Instead, utilities want to be able to shop bids for solar power from a few larger producers, on the assumption they would be able to negotiate better prices based on higher volume. “We believe competitive bidding from large private developers leads to lower prices,” said Northeast spokesman Michael Durand. Drawing on its experience of buying solar power for its Connecticut customers from just a few larger suppliers, Northeast estimated that Massachusetts consumers would pay an additional $1 billion over 20 years if utilities have to buy from numerous small producers as contemplated by state regulators. Similarly, National Grid argued it could buy solar power for 20 percent less if it doesn’t have to spread its purchases among hundreds of small, medium, and large suppliers. “What we’ve said is give us more large-scale projects and we’ll make this plan work,” said National Grid senior vice president Ron Gerwatowski. “We could have a full-fledged program up and running” soon. Sylvia said the administration has reviewed the utilities’ concerns and has agreed to launch a pilot program to determine whether buying solar power from a few large suppliers would result in lower prices. Though prices have fallen in recent years, solar power remains expensive compared to electricity produced by conventional fuel sources such as natural gas — up to two to three times the price. Massachusetts officials envision the new targets triggering a proliferation of solar power across the state, from fields of solar arrays at former landfills, to smaller strips of panels on the rooftops of homes and businesses in every community. But the utilities’ objections, coming nearly a year into consideration of new solar targets, drew sharp criticism from alternative energy field officials. “They knew this was happening all along and only now they’re saying, ‘Oh, we don’t like it,’ ” said Carrie Cullen Hitt, senior vice president for state affairs at the Solar Energy Industry Association, which represents more than 1,000 solar power companies across the country. Hitt said the late objections suggest utilities are trying to control who produces solar energy in the state. She predicted Massachusetts will have “plenty of competition” from solar producers that will keep power prices down. Meanwhile, Robert Rio, senior vice president of the Associated Industries of Massachusetts, said his business group is closely monitoring the new solar rules, as many of its members are huge consumers of electricity.